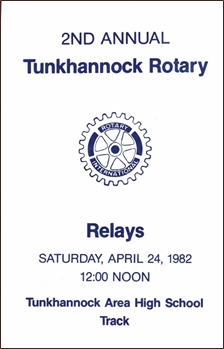 From 1981 (first relays on April 25, 1981) until 2012, the Club hosted local junior (1991-2012) and senior (1981-2007) high school track teams at the annual Rotary Relays, which were Pennsylvania Interscholastic Athletic Association sanctioned. Although for a time both junior and senior high school teams competed in the events, toward the end of this timeframe (2008-2012), the event focused only on junior high school teams. Athletes from all over Northeastern PA participated in different track and field events. Unfortunately, after 33 years, the Program was discontinued in 2013 when the PA state budget cuts for the schools resulted in some junior high school track and field teams being disbanded and/or unable to find funds to even transport their athletes to the event.